Thor is exactly the high-meets-low middle ground Paramount chose by hiring the eminent, literate Kenneth Branagh to direct a tentpole about a comic book character. Branagh—poised for a career comeback with this hybrid of Shakespearean style and summer spectacle—offers a handsomely-mounted big-screen interpretation of the God of Thunder by way of Marvel Comics, while simultaneously launching born superstar Chris Hemsworth. Fast Five's $86.2 million opening weekend started summer a week earlier than expected, but given the second week dropoff of the franchise's past installments, Thor will command considerable numbers at the box office before settling into a comfortable spot on home video among the middling entries in Marvel's expanding cinematic universe. 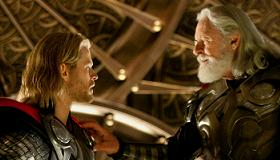 Of Thor's many virtues, the greatest is its gorgeousness. Working with costume designer Alexandra Byrne, production designer Bo Welch and cinematographer Haris Zambarloukos, Branagh creates an opulent universe of gods and men that will make audience members want to pause the film and focus on all of the little fore—and background details. Meanwhile, the filmmaker takes a page out of the playbook of Ang Lee's Hulk—and the ‘60s Batman television series—with his deliberately cartoonish use of canted angles and comic-book framing in order to unify the "real" and otherworldly worlds via a cohesive, but suitably heightened atmosphere. The actors find surprisingly sure footing as they straddle the demands of a formal world of gods and the decidedly more colloquial one of mortals. Hemsworth has the heaviest lifting as both the film's authoritative hero and its fish-out-of-water joke, and he nails both the fundamental arrogance of Thor's birthright and his charming naivete to when his arrogance offends. Portman offers Thor a spunky, smart companion with her bombshell scientist. She's not fully three-dimensional, but she's at least two—a bonus in any blockbuster. But as Thor's respective villain and comic relief, Tom Hiddleston and Kat Dennings are the film's secret weapons. Buffoonish as Thor's behavior is on earth, Dennings's character cuts to the heart of the audience's incredulity, while Hiddleston gives Loki a depth and empathy that makes his sinister master plan seem, well, almost understandable. Unfortunately, the committee-designed script never finds a consistent balance between building characters, delivering action and pushing the story forward. For example, the first action sequence—a showdown between Thor and the Frost Giants—has all of the architectural elements of a breathtaking, auditorium-rousing set piece, but its execution feels perfunctory. Designed solely to showcase Thor's arrogance, its bloodshed is emotionally bloodless. And there's as much talking about what characters have done or will do as there is footage of them actually doing it. The expository monologues are relatively unobtrusive, but the film still leans on retroactive explanations to justify its more dubious choices, like, say, surviving a seemingly deadly wound thanks to a "healing room" mentioned only in passing. Meanwhile, there are conspicuous gaps between scenes later in the film, as if the studio chose unwisely in the Sophie's Choice between a shorter running time and a more satisfying story. Neither disaster nor triumph, Thor is an aggressively average crowd-pleaser. If there's any significant success here, it's in introducing an otherworldly element into Marvel's movie universe, which to this point has stuck practically to earth and science (or at least "science"). Thor and Loki will return to the screen in 2012 for the all-star The Avengers, where they'll hopefully have something more substantive to do. But as single-serving sustenance made to feed the continuing interest in superhero properties, Thor unfortunately isn't mighty enough to do more than sustain the status quo.